From the towering Russian Mammoth to the multi-branched, red-flowered Moulin Rouge, sunflowers (Helianthus annuus) are bright ambassadors of sunny summer afternoons. When fall rolls around, however, the leaves die, the stalks brown and a top-heavy stalk sits awkwardly in your landscape. When sunflowers die, grab a sturdy pair of gloves and prepare your garden for the next season. Most members of the Helianthus family are annuals. Cover sunflower heads with a ventiliated bag to disuade hungry birds. If you have planted a giant sunflower, do not forget to harvest the seeds before the birds do it for you. The leaves along the stalk may still be green; they start their end-of-season decline after the yellow petals surrounding the seed-heavy head are dead or have already dropped. Cut the stem roughly 12 inches from the head when the back of the head is a golden yellow or brown, the petals are dead and the seeds are plump. Hang the head in a sheltered, dry area, and then knock the loosened seeds into a container to fully dry. Unfortunately, disease may kill your sunflowers before their time. Downy and powdery mildew -- fungi that form silver, dusty patches on leaves and stems -- do not usually cause severe damage. 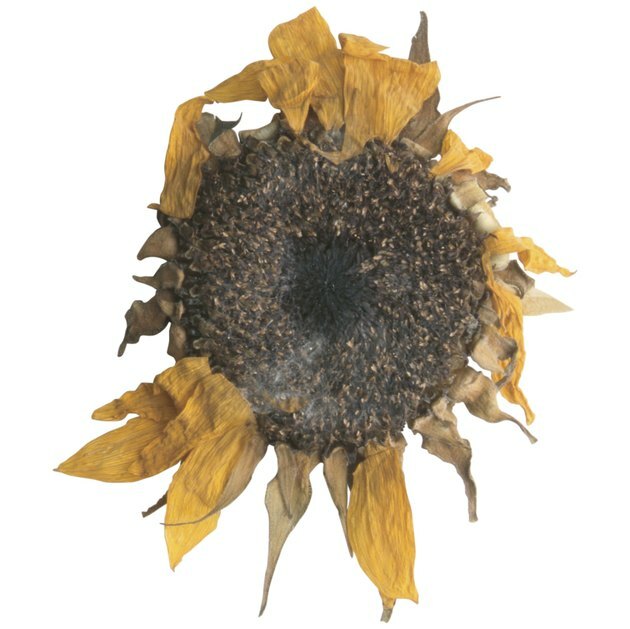 Verticillium wilt and sclerotinia head rot, however, wilt your sunflowers, form dead patches on the leaves or stems and may affect nearby plants. If a sunflower dies from disease, pull it immediately and dispose of it in the trash. Never compost diseased sunflowers. Dried stalks snap in half to fit in your trash can, but green stalks resist bending. Once your annual sunflower dies, simply uproot the plant and knock off excess dirt from the roots. Sunflowers, especially the taller varieties, usually form a single taproot and a thick mat of side roots. Dry, mid-sized plants will not put up much of a fight, but larger plants may cling tenaciously to the ground; water the area before pulling to loosen the soil. If your sunflowers have a single, woody stalk, do not wrestle with it. Instead, grip the top of the stalk and pull sideways, using leverage to pry the base from the ground. Wasps can hide in the most unlikely places. Use gloves when handling sunflower stalks. Small spines cover the stalks, and, while they do not seem imposing, they easily cause skin irritation. 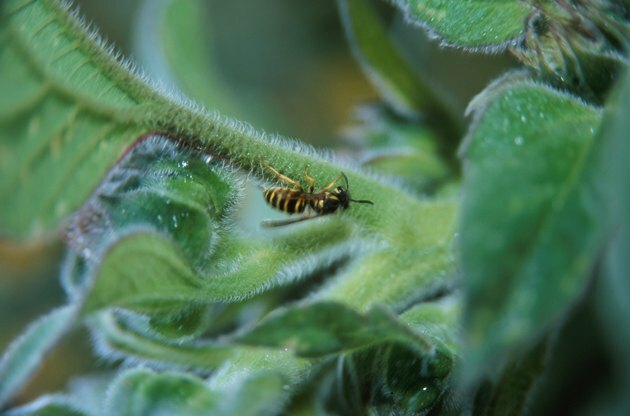 If red ants or wasps frequent your garden, be wary if your leaves are still green; ants and wasps often farm honeydew from aphids hidden on the underside of your sunflower's broad leaves. 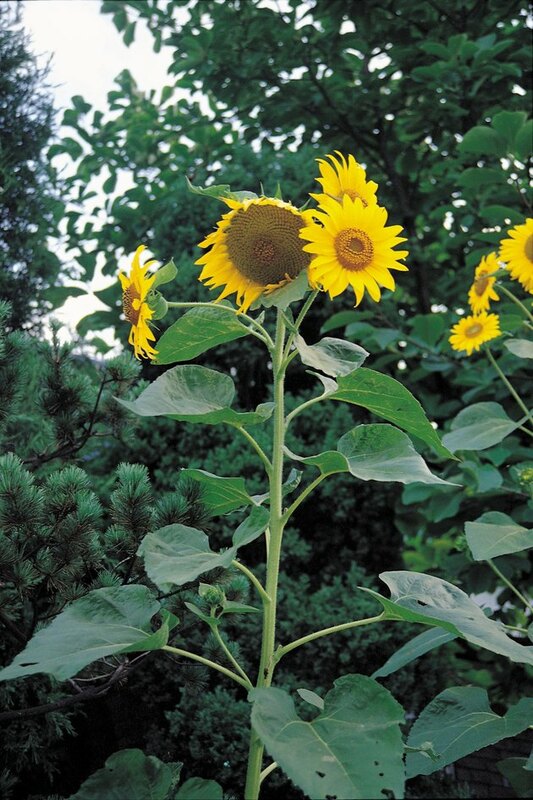 Remove any large, tough stalks before adding dead sunflowers to your compost pile. The stalks do not break down easily and become a nuisance.